Go on Pinterest and you'll find thousands (probably millions) of Earth Day activities. Try scrolling to the bottom (I had to give up) and you will see that Earth Day is not lacking in ideas but how about ideas that stick? For something as important as Earth Day, we need to establish strong connections to make the learning stick. The point of any "XYZ Awareness Day" is to raise awareness but for the earth, raising awareness is not good enough- not anymore. We need to create a consciousness where awareness is not only raised but it becomes part of our value system and guides our daily decisions. We are not there yet. This reminds me of the exercise where you tap your head and rub your tummy in a circle. It's not easy but it's good for the brain. For our testers, the parents like to be simple. We just start with dirt and sand. But we'll do it with toys because learning through toys have an unusually sticky quality that can't be beat. What do you do with dirt? Again, let's be simple and just dig. 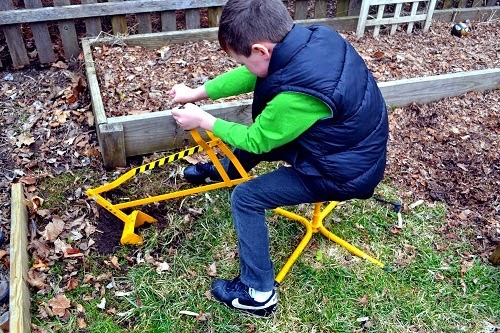 Dig here, dig there and our testers (7,8, and 9) did just that, in their backyard. They had a blast. But digging has to be a challenge right? 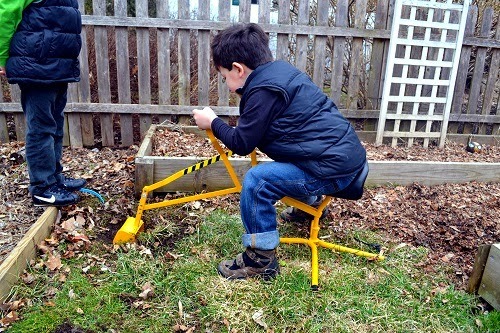 So our testers tried out The Big Dig by Reeves Toys. 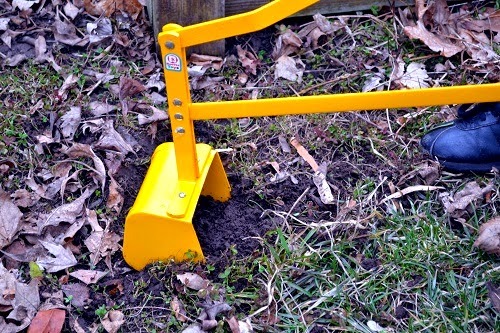 I have always wanted a digging toy. Sometimes we go to kids' museums and there happens to be one. It's fabulous. You get on, it looks easy but kids do have to think a little. One handle has one function and the other handles has another. Kids must figure that out and then figure out how to coordinate both at the same time to make something happen. When does a person need to have two hands doing two different things to make one thing happen? Think piano, think guitar, think typing... all good things and now you can add The Big Dig to the list. She's 2.5 years old and she is rocking this! The weight limit is 110 lbs and this 2nd grader is enjoying himself immensely. Tester 7 is so cool! Assembling was easy and moving it around from one part of the backyard to the other was a cinch. They are even talking about bringing it to the beach. That's right, Big Dig can get wet, it can stay out there in your yard. While we haven't had it long enough, we are not concerned about rusting. 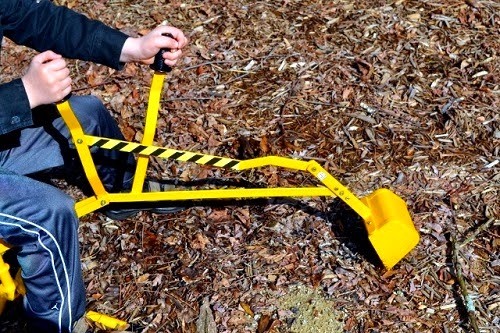 I am looking forward to hearing the testers digging up some snow. But truthfully, to me, the shining star of Big Dig is the price tag. Anything like that being under $45 is pretty much UNREAL and remember, this is supposed to be an all-weather toy. And Reeves Toys is part of Reeves International and they distribute excellent high quality toys from all over the world to bring to American families (Breyer horses, Red Toolbox, and Tolo). I always expect excellent quality from them. Currently, Tester #10 (my niece) is testing their newest line WOW Toys (baby, toddler toys) and I love that little girl so much, there is no way I am letting her near anything but the best. I love when kids give it their all! That's one DEEP dig! How beautiful is this digger? Can you picture it in the snow? Supposedly this is an all weather toy. This family will be taking theirs to the beach. Parents are totally up for it. It's not that heavy. This is the easy part folks. You don't need a curriculum or a worksheet to guide you. Just dig and talk about what you find underground. Everything you find from the quality and characteristics of the soil to anything else interesting that is dug up will give you something to talk about, whether it's an earthworm or a piece of garbage. Whatever they dug up will be best remembered and as the grown-up you can help make that connection to the rest of the world. That's the kind of knowledge that sticks the best because you didn't dig it up, they did. Dirt and sand can do amazing things! 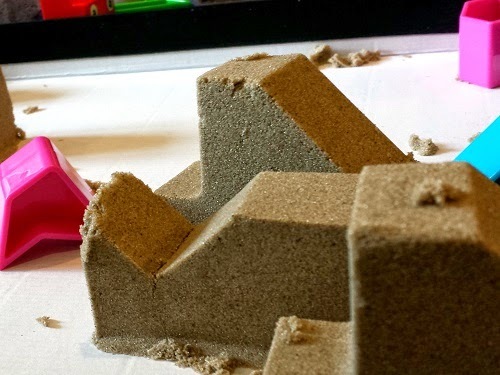 You can make little prints and patterns with Kinetic Sand. I used to have Moon Sand in my house. I got it because #2 hated sand but he could tolerate Moon Sand for some reason and so to make sure that our summers were sand-friendly, I had him play with Moon Sand in the winter months so that we would already have him acclimated. Even though the texture was much finer and less messier than real sand, my husband hated Moon Sand. One day, I left the house for a long meeting and when I came back, I found that Mr. Toys Are Tools had thrown it out! I really needed to have sand back in our home but what could I do? 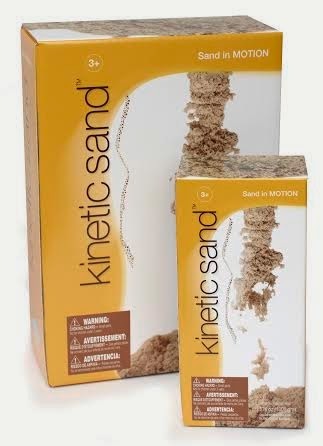 Luckily, we now have Kinetic Sand which has a texture finer than regular sand but not as fine as moon sand. For me, I want something to feel like sand as much as possible. Not every kid must play with everything but how can you not want your kid to play with this? Sand play is excellent! I had no idea that he'd start writing with this hook that we use for Rainbow Loom. So cute! Being out of the game would mean all those things and I would know it would happen everytime I met a friend at a new playground and realized... "Damn, this is a sandbox playground. $@#%!" 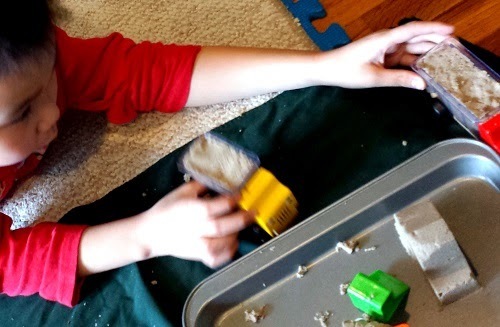 I can't stress enough how I wish Kinetic Sand had been invented when my guy was little. For sure, it would have been our sand of choice in our cramped NYC apartment and it would have been more effective in keeping his sensory sensitivities at a minimum. I am sure of it. Those of you who have read my Trucky 3 review, I told you-- this puzzle rocks as a toy! Three years later and there is still nothing like Trucky 3 out there. It's so special! I'm saving this one for grandkids. 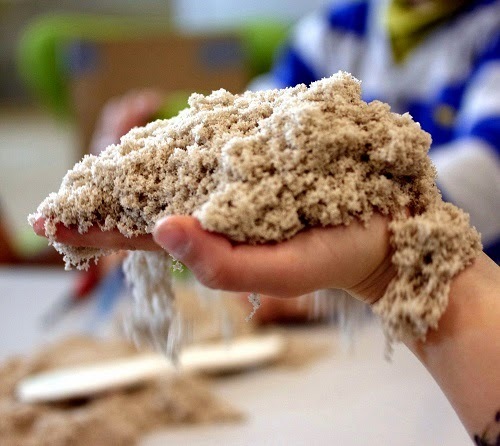 Sure learning and discovery happens at the beach but I think sand play can help plant seeds of the kind of consciousness that we don't have yet. These connections are not so much thought but rather, it's tied with deep feelings or memories of sensations. Kids will remember things like how their feet feel when the sea water washes their ankles. They will notice how to spot a really big wave forming and jump just at the right time. They will notice the shells, the jellyfish, the seaweed and what is caught in it (hopefully not garbage). They may even remember how their parents had to adjust the umbrella throughout the day to stay in the shade. 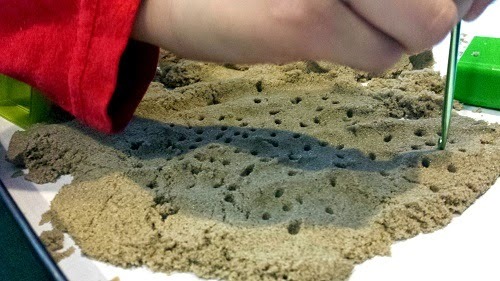 What I think they will most remember is how calming sand can be, which you can also enjoy via Kinetic Sand at home. We can teach them about the earth while we play or we can let them learn it at school. All of us grown-ups learned about the earth too but we learned more of those harsh facts when we were older and our memories of beach play are so faint now. For our children now, we need to strike while the iron is hot - when they feel most connected to the earth. The older they get, the less opportunity they'll have to touch dirt and sand. Play is the one simple and yet powerful difference that I think could move us way beyond a passive state of awareness and into a mentality where we are consistently proactive about doing the right thing. I love these little guys! They go so well with Kinetic Sand! 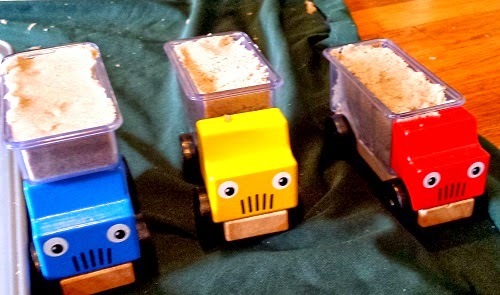 USE Rafflecopter to Enter This Amazing Contest to Win your own Big Dig and Kinetic Sand!!!! 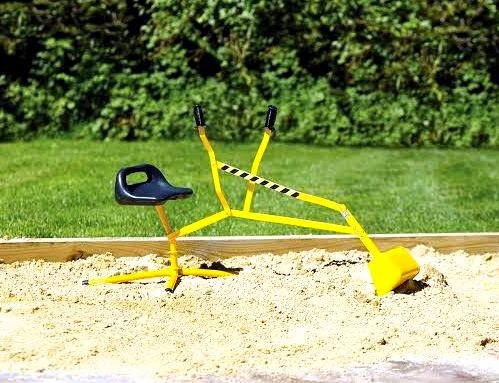 I would definitely take the digging toy to the beach! Picking up wet sand would be so fun. And it would be very social too. Other kids would come to play with my kid who is kind of shy. great idea Julie! you could teach kids to take turns. I would bring a Time Timer Plus to that playground! 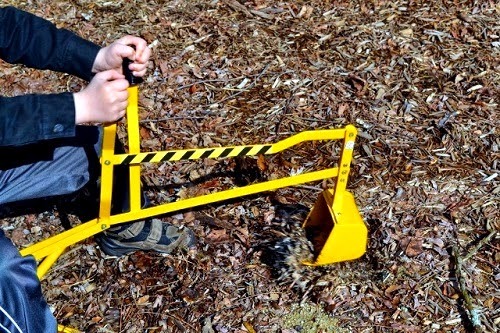 We could use the big dig for nature exploration. 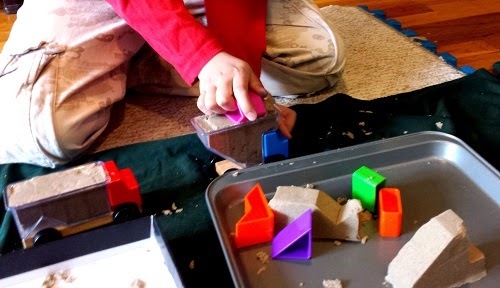 My daughter and I love the kinetic sand too; it's actually one of the few toys in our house stacked with toys that are true "go-to" toys. 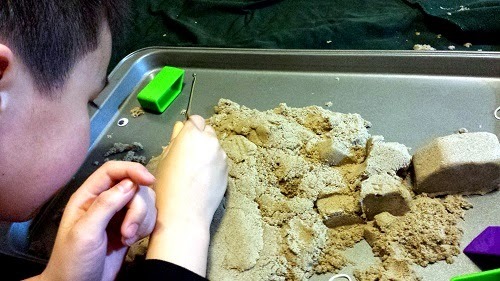 She loves the feel of the sand, but what I think is so amazing is that it seems to add that extra level of realism in her pretend play to really keep her engaged. She uses my Playmobil toys (that's right, mine!) with the sand - she buries them, makes footprints with them, uses the little shovels to dig. It's pretty wonderful! Oh how cool of your parents to have saved your toys! I love hearing that! With the Kinetic Sand being less messy (no water-yay!) it would be completely versatile to what the kids could imagine doing with it. Also more flexible to when they want to do it-inside or out. That is important, in keeping things on an even keel. Less pressure, more creativity flowing! With the Big Dig. 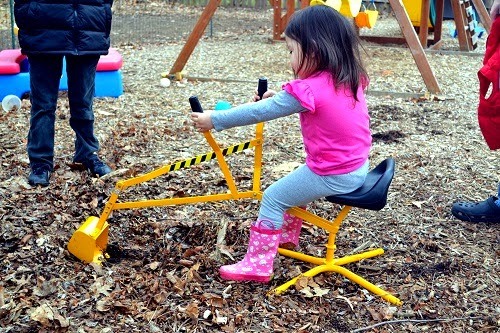 I could see them using it for turning our small composting heap. They could use it for their garden, in the sand box, and at the lake. I love your idea for snow! They would probably like that the best.